Just a week or so ago I wrote, "All this time we witnessed a steady increase in career politicians and a corresponding decrease in a ruling class with any real understanding of people, society and dare I say, togetherness. I cannot see or perceive of any way this can ever be altered other than catastrophic events too big for the powers that be to buy off or withstand from their ivory towers." This crowd of ill informed and poor specimens that masquerade as "students", who, as Dizzy pointed out can't even spell the Chancellor's name, are just part of Labours' university for otherwise dole fodder placements. 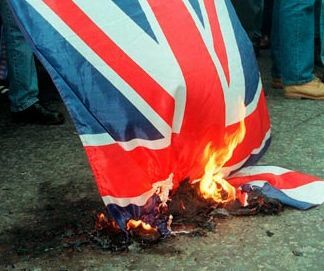 Ignorant of the real Government that hides behind the facade of Westminster, this violence is spite and venom expressed from a stance of ignorance. Amazing how the culprits behind our dire economic straits languish in a lack lustre sanctuary of opposition. They wait patiently the Federal states of Europe signing, their pieces of silver and garlanded appointments. Then they will take their places alongside the likes of Clegg, Cameron et al. Then after a few years of blatant elitism and nepotism, as seen in The Soviet Union, the real riots will kick off, aimed at the then undemocratic totalitarianism of the day. By then the Turk dominated EU Army and riot Stazi will fan out through every major city. This foreign legion will be invincible and draconian. The tea party of these teenie twats of today will be as nought. The beatings and killings will be targeted and efficient. The reality of the wrong targets, featured today, will become apparent, even to the poverty of intellect we see today and guaranteed tomorrow. The ghost of Orwell stirs. Right on the money, sir. Your analysis of the situation is spot on, and your vision of the future under the EU Soviet is the same as mine. I fear for this country. What appals me is the unwillingness - or is it inability? - of allegedly intelligent people to think for themselves. They have allowed the media and their favoured politicos to do their thinking for them. They'll one day wake up to the bitter fruits of their spinelessness and their unthinking docility. Thank you kindly, Pusscat! We can still smile. Even concentration camp inmates managed the odd one. We used to talk abour 'Thathcher's childern', now we have Noo Labour's entitlement generation. How bitter are the lies revealed to young minds full of hope not earned but expected. Sainsburys and Tesco will have the most educated workforces in the world. Yup, the tiles have started to come off the roof and the young ones have even less of idea of whats coming than the politicians. You are right again, the students know nothing but what they are fed by the Liebore agitators in their midst I troubles me that they do not/cannot see beyond the veil to the controlling powers that really be..
We need to educate them in the realities of this our world before the Turks are implemented upon us! Thank you all for your always erudite comments.